The Adventuress: Homestar Ruiner is out now! Homestar Ruiner is out now! Homestar Ruiner, the first episode of Strong Bad's Cool Game for Attractive People, is available to purchase today. The PC version is available now worldwide, and can be purchased at Telltale's site. US Wii owners can buy the Wiiware version from the Wii Shop Channel today. The European Wiiware release will be happening this Friday. I have played through the game and absolutely love it. I'll post my review of the game soon. 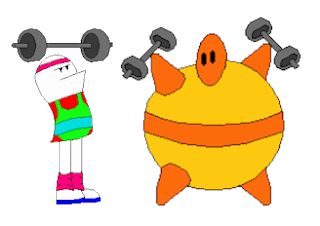 Be sure to check out the preview for the next game, Strong Badia the Free, from the menu of Homestar Ruiner (it also plays automatically after you beat the game). It's brilliant.